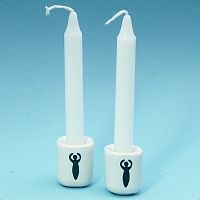 - Set of 2 candle holders. 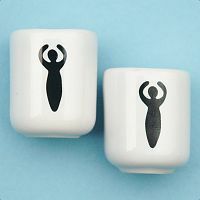 White porcelain with black Goddess design. 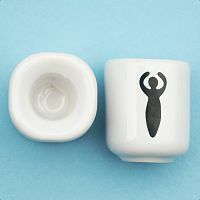 Just over 1" tall. Opening is 1/2" in diameter, just right for our small candles. Do you have any other questions about our Pair of Goddess Mini Candle Holders? Wonderful candle holders with very fast shipping. I am pleased with my purchase, and recommend shopping with Gryphon's Moon. Beautiful candle holders. They look great on my altar and add a wonderful touch to it. They work very well with the candles I ordered. I would highly recommend them to anyone.